Fortunately, I have the second point covered as there is a nice, uncut Melanio sitting on one of the stirrups of my Stinky Ashtray. In both length and ring gauge this is a smallish, box pressed cigar with some imperfections on the wrapper. However, the look of this wrapper is pretty fascinating in that the color ranges from medium brown to much lighter shades of brown around the veins. It’s also a fairly oily cigar. If you were thinking that there’s something special about the wrapper, maybe it’s some kind of new leaf code named “Melanio,” you would be wrong. 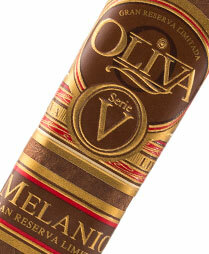 Melanio Oliva is believed to be the first person in the Oliva family to grow tobacco (link) and that is where the name comes from. Maybe it is a special leaf, I don’t know, but I wouldn’t be surprised if in some marketing materials you would find that the wrapper is described as being special because that is pretty much de rigueur for cigar marketing. The flavor profile starts out with dry spice that lingers in the nose, cream and oak. Not a very strong cigar strengthwise but the flavors are nice and mix well together. During the second third there is a subtle change in the flavor profile as it moves away from the spice and more towards the cream spectrum. Oak is still present and there is a little bit of chocolate in the background as well. It’s tasty and more than a bit different from what you would expect from an Oliva Serie V.
The final third is pretty much the same as the second with the cream and oak. But, the chocolate is gone and in its place is a meaty flavor. Medium bodied with a good draw and burn; this cigar is enjoyable. What is really interesting about this cigar is that it really illustrates the importance of the wrapper as a component of the overall flavor profile (even though I’ve heard that there are some slight changes to the filler tobaccos used in the Melanio from the blend in the original V I think what I said holds true and comparing the original to the Melanio would still be an interesting exercise for you). Whereas the original V features a plethora of robust, even aggressive, flavors the Melanio is much more reserved. Personally, I like the original a lot more but I can see how this cigar would appeal to those who like more medium bodied cigars. I’d assume that if you pick up one of the thicker vitolas the flavor profile would be more reminiscent of the original V because the ratio of filler/binder to wrapper tobacco would be greater.